Don't miss your chance to see Richter City Roller Derby league take on Dead End Derby Christchurch Rollergirls in a rare doubleheader in Wellington! 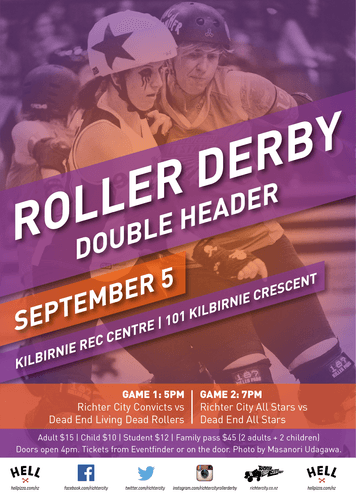 Richter's Convicts will take on DED's Living Dead Rollers at 5pm in a curtain raiser featuring each league's development teams. To follow at 7pm will be the much anticipated matchup between the NZ #3 ranked Dead End Derby All Stars vs the NZ #1 ranked Richter City All Stars in their first bout in Wellington since 2011. Now in its 7th year of public competition, Richter City is the premier derby league in New Zealand and spectators will have to get in quick for the limited number of seats available.